Even though it’s an uphill battle, I’m glad there are some lawmakers willing to fight Obamacare. They realize a hard battle today could help save America from genuine fiscal crisis in the future. I don’t know how this government-shutdown battle (which is morphing into a debt-limit battle) will end, but I’m hopeful the taxpayers get some sort of victory. The 2011 fight over the debt limit, after all, gave us sequestration, which has been Obama’s biggest defeat. Heck, maybe in this year’s fight we can even keep the government shut down long enough that people realize that we can do without much of the Washington bureaucracy. If nothing else, this fight has exposed the callow, juvenile, and spiteful mentality of the President and his team. These Washington hacks are trying to make the shutdown as painful as possible for innocent third parties. Mollie Hemingway has a must-read article at The Federalist with lots of disgusting examples. Here are the ones that strike me as especially cruel, dangerous, and/or petty. Last week the Obama Administration chose to barricade the World War II Memorial to keep aging veterans and other citizens out during the so-called government “shutdown.” It’s tremendously wasteful to spend taxpayer funds and personnel shutting down an open-air memorial that could be visited at any time of the day prior to the shutdown, whether staff were nearby or not. But more than that, it’s just cruel: World War II veterans are on a race against time to see their memorial. …the feds shuttered the Amber Alert web site, which posts pictures of missing kids. …Amber Alerts aren’t even federally run. They’re mostly run by the states themselves. It took more time and energy to shutter the site than to just let it keep running. Every other juvenile justice program kept running… The National Park Service placed cones along highway viewing areas outside Mount Rushmore this week, barring visitors from pulling over and taking pictures of the famed monument. 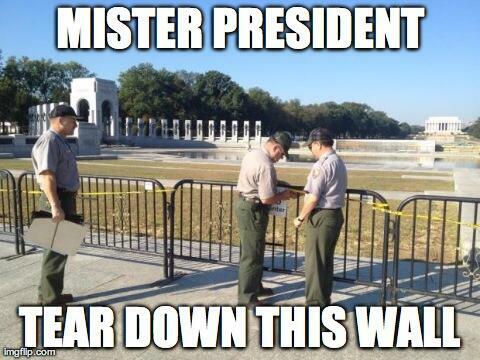 This pettiness extended to attempts to shutdown privately-run rival visitor sites such as Mt. Vernon, George Washington’s home. …The list goes on and on and on. The feds put 77-year-old Joyce Spencer and 80-year-old husband Ralph out of the home they’ve owned since the 1970s because it sits on federal land. This goes way beyond the ordinary Washington Monument Syndrome, which occurs when politicians try to make supposed budget cuts as painful as possible. The Obama White House is adding steroids and meth to that Syndrome in ways that are so pathetic that you would think their strategy will backfire (just like the Massachusetts Governor went overboard when he said budget cuts would lead to zoo animals being euthanized). And people wonder why I mock politicians!?! Since the Obama Administration’s petty actions seem like a joke, let’s close by sharing some real jokes from the late-night talk shows. President Obama has officially canceled his trip to Asia. He said he didn’t want to be in Indonesia not doing anything to solve the crisis when he could be in Washington not doing anything to solve it. Actually, it’s the perfect time for President Obama to go to Asia. I mean, what better time to leave Joe Biden in charge of the country than during a shutdown? This government shutdown thing is getting old. The national parks are closed, museums are closed, and federal agencies are closed, but our borders are wide open. Don’t worry about that. It is day three of the government shutdown. Right now 33 percent of the government is doing absolutely nothing, which is not bad considering that before the shutdown 80 percent weren’t doing anything. According to a new report, experts in Pakistan say $25 million in cash is smuggled out of Pakistan every day, and less than 1 percent of Pakistanis pay any income tax at all. Here’s the amazing part: Somehow their government hasn’t shut down, but ours has. How many are worried about a government shutdown? How many are more worried about it starting back up? I’m glad the government has shut down. Think about it, for the first time in years it’s safe to talk on the phone and send emails without anybody listening in. At first people thought the government shutdown would last maybe a day, at the most a week. Now people are concerned, and experts are saying the shutdown may last as long as a Kardashian marriage. Almost a million non-essential government employees were let go. Well, isn’t that the problem, that there’s that many non-essential employees? Even the NSA is out of business. And while they’re closed, while the government is shut down, they are asking citizens to please spy on each other. Republicans were hoping John McCain would help them get their way on the spending bill — because if there’s anyone who can beat Barack Obama, it’s the guy who lost to Barack Obama. After Congress failed to reach an agreement on a new spending bill, the federal government officially shut down. So roads won’t get fixed, public employees won’t be able to help you, and getting a federal loan for a house will be very difficult — but there will also be a lot of differences. The shutdown means the national zoo is closed. Who’ll feed the animals? Is anyone even there to lock them up at night? Pretty soon starving lions and tigers could charge out of the zoo. They’d devour the fattest, dumbest people on Capitol Hill. Actually that might be the answer to all of the problems. Nonessential government services have been put on hold. Flight safety inspectors furloughed. National monuments closed. The Grand Canyon is closed — they filled it with spackle. Having recently renewed my passport, the last Jimmy Kimmel joke hits a bit too close for comfort. But the best two jokes, in my humble opinion, are Letterman’s quip about non-essential employees being part of the problem and Leno’s line about how we should really worry about the government starting back up. Gee, this is almost enough to make one conclude that we would be better off with a much smaller government! P.S. Other examples of government shutdown humor can be enjoyed by clicking here, here, here, and here. Offish topic, but I only recently discovered Craig Ferguson (thank you Netflix) and he has become a U.S. citizen in recent years. Our total gain. Obama is very funny but it sad that it is not only his jokes but his policies.